Win FREE Books! #SparksInTheDark #KidsDeserveIt & #StoriesFromWebb! 09 Jun Win FREE Books! #SparksInTheDark #KidsDeserveIt & #StoriesFromWebb! It’s summer! For so many educators that is finally their chance to catch up on great professional development books. But sometimes it always isn’t in our budgets to get all the great books we want….and I love giving things away, so I had an idea!! 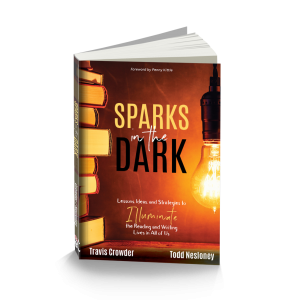 First, I’m giving away TEN copies of my newest book (co-authored with Travis Crowder) entitled Sparks in the Dark. Need some ideas when it comes to reading and writing instruction? Need a book that reaches other subject areas too, and campus wide, and both secondary and elementary? This is the book for you….so….if you purchase a #SparksInTheDark tshirt HERE, you’ll be automatically entered to win an autographed copy of #SparksInTheDark. Autographed by BOTH me and Travis. **100% of the proceeds from the Sparks shirts are donated to Donors Choose projects that promote literacy. Second, I’m giving away TEN copies of my second book, Stories From Webb. 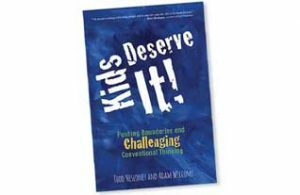 This book is my follow up to #KidsDeserveIt. It’s written very much in the same vein as KDI, but I wanted to do something different than every other book out there. So I enlisted the help of my team over at Webb Elementary where I’m principal. Throughout this book are instructional ideas, heartfelt stories, real life examples….and all from people who are in the trenches every day, just like you. The school counselor, nurse, librarian, instructional aides, teachers, even the campus secretary! This book is my heart on the page. 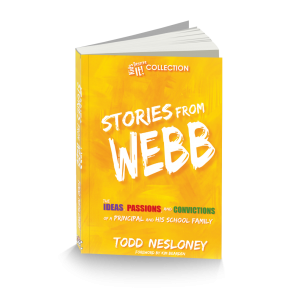 So…if you purchase a #TellYourStory shirt from this month’s campaign, HERE, you’ll automatically be entered to win an autographed copy of #StoriesFromWebb. 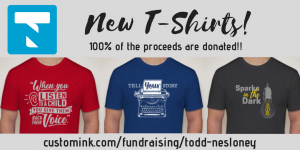 **100% of the proceeds of the Tell Your Story shirts are donated in my mom’s memory to provide books to Title 1 Schools. And finally, I’m giving away TEN copies of my first book (co-authored with Adam Welcome), Kids Deserve It! This book was my first foray into writing something that I hoped would eliminate excuses, inspire others, and share some ideas along the way. I had a BRAND NEW t-shirt created with a quote from KDI. If you purchase a new #KidsDeserveIt shirt HERE, you are automatically in the drawing to win an autographed copy of #KidsDeserveIt! ** 100% of the proceeds of the KDI shirts are donated to teacher’s Donors Choose projects. I can’t say THANK YOU enough for all the support of everyone who’s ever purchased a shirt, book, posted a sticker, or worn their KDI bracelets. This community is like none other! It’s why I wanted to have you grab a shirt and potentially win something in return! The giveaway ends Friday June 22nd!